WAILUKU –Division of Conservation and Resources (DOCARE) Enforcement Officers and Makai Watch volunteers with the Department of Land and Natural Resources (DLNR), Community Fisheries Enforcement Unit (CFEU) will be at the Maui Mall this Saturday, December 20, 2014 from 10 a.m. to 2 p.m. to help educate fishers about the new Maui Island fishing rules that became law on November 1. The new rules affect the take of all uhu or parrot fish species, and many goat fish species such as kumu, moano kea, and weke. “The event this Saturday will help to reach fishermen and answer their questions about the new rules,” said Matt Yamamoto, Maui DOCARE Branch Chief. “This is a preventative measure as we’d rather educate than issue citations,” he said. Fishers will also have an opportunity to learn about “Makai Watch”, a volunteer component of the CFEU designed to assist officers with educational efforts and to serve as additional “eyes and ears”. 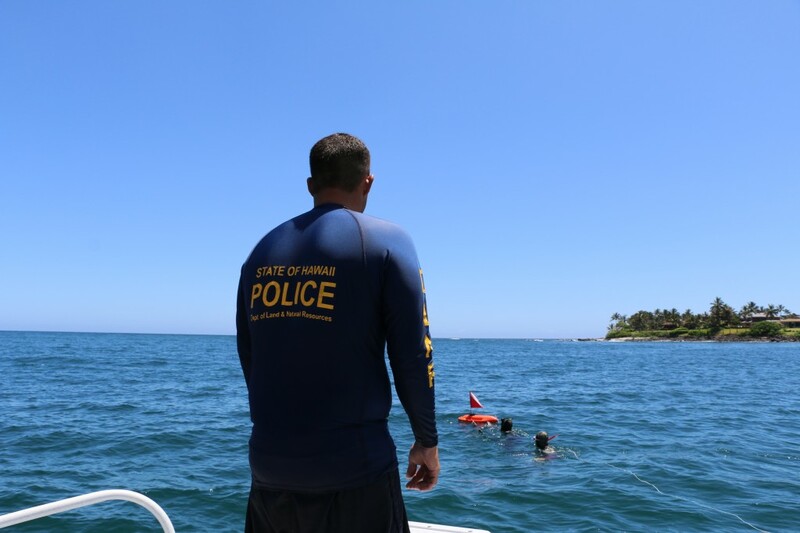 They also assist by manning education stations to increase awareness about the CFEU, a first-of-its-kind initiative for marine fisheries enforcement in Hawaii. Makai Watch volunteers rove the beaches within the CFEU project area where they distribute copies of fishing regulations, observe and document various activities, and remove marine debris wherever possible. Since May 2013, CFEU officers and DOCARE colleagues have documented 1026 inspections, conducted 95 investigations and issued 62 citations to fishermen for fisheries related offenses. Officers also confiscated 3048 feet of illegal gill nets and 12 illegal throw nets. All violators were required to make court appearances and most convicted were ordered to pay fines between $100 – $250. Recently, one repeat offender was fined and sentenced to 4 days in jail. His violations include two counts of unlawful use of nets within the Kahului Harbor Fisheries Management Area (FMA), exceeding the FMA bag limit, and possessing a throw net under the 2-inch minimum mesh size. “As we see compliance increase in the area, fishermen are seeing more fish. A big part of achieving voluntary compliance is having fishermen who understand the rules, so our education and outreach efforts are very important,” said CFEU Supervisor Jeffrey Kinores. CFEU enforces fisheries laws in the northern portion of the moku of Wailuku, a 13-mile stretch of coastline between Hulu Island and Baldwin Beach Park. The pilot project is funded in part by Conservation International and the Harold K.L. Castle Foundation. The project is set to end in June 2015 unless permanent funding through the state legislature is provided. To learn more about the new rules visit the DLNR’s website at www.dlnr.hawaii.gov/dar. To report violations, call DOCARE toll free from anywhere in Hawaii, 643-DLNR. People interested in joining the CFEU’s Makai Watch efforts can call (808) 873-3990.